"I had to know that the callings were right, that it is all connected." "To us, to each other. That's what all of this is for. It has to be." "Great. You got a sign. Where's mine?" In this episode, Ben goes undercover as an accountant and card shark, while Michaela and Jared put one of her callings to good use in solving a murder. After Cal is released from the hospital, Ben hires on at a meganormous accounting firm with a lot of "Tier 1" clients including General Electric Unified Dynamic Systems, where his supervisor is a boisterous Flight 828 fanboy. While Ben doesn't have access to the GE UDS account because he's in an entry-level position, he does manage (thanks to some effective amateur spycraft) to find out that celebrity fellow 828 passenger Fiona Clarke is on the UDS payroll via something called "SP." Fiona Clarke, it turns out, is something of a wild card. Once a well-respected neuroscientist and CIA advisor-analyst, she became fixated on the idea of developing "collective consciousness"--networking everyone's brains to everyone else's by stimulating "mirror neurons"--and wandered out of the scientific mainstream and deep into Deepak Chopra territory. Her newfound notoriety as an "828-er" has her back on the lecture circuit espousing her deep(ak) theories. Ben and Saanvi learn from her that "SP" is a private nonprofit called the Singularity Project. ...home with him, not to the NSA office. Convinced that Ben is really on to something, he's decided, for now, to look into things personally and keep his own agency out of the loop. Meanwhile, Michaela gets another calling in the form of a heartbeat only she can hear and feel. It leads her to help Carlos, a young man who witnessed the murder of his uncle. Jared is remarkably cool with the idea of following Michaela's calling, and it eventually leads them to catch the killer. and convince Carlos not to take matters into his own hands In their last scene together, Michaela finds out that Carlos received a heart transplant, and that Evie was his donor. At the very end of the episode, Michaela is talking to Ben about how the day's calling was a sign to her that it's all connected. (See quote at the top.) Ben quips that he hasn't gotten a sign, but there's one hanging right there on the refrigerator door. 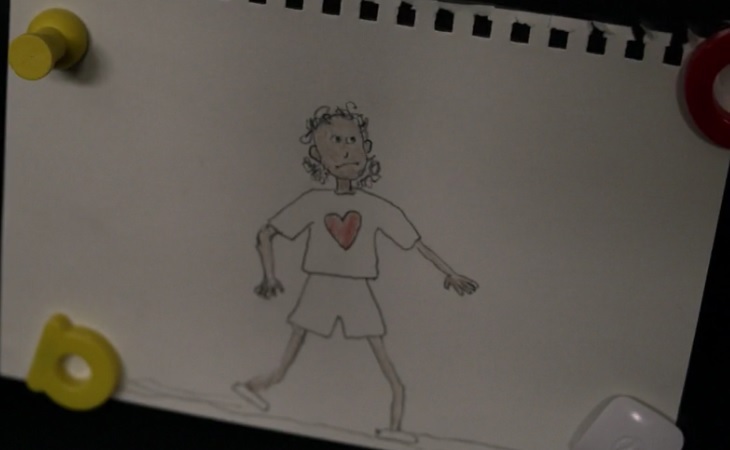 A drawing Cal did, a few days before the events of the episode, of Carlos with Evie's heart. No visual sightings this week, unless I missed something. Plenty of dialogue, though. The word snafu--originally an acronym for "Situation Normal, All [expletive]d Up"--was coined in the U.S. military around 1940. It first appeared in print in the September 1941 issue of the scholarly journal American Notes and Queries, and by the summer of 1942 was so commonly understood that a Life magazine article used it to describe the chaotic state of gasoline rationing. Beginning in 1943, the Army even produced a series of comical animated training films called Private Snafu. So what's the "snafu" that the title refers to? Vance intercepting Ben and getting the flash drive? The Ben-Olive-Danny dynamic? Or something else entirely? Those "mirror neurons" Fiona Clarke talks about are a real thing--"a neuron that fires both when an animal acts and when the animal observes the same action performed by another"--and you've got oodles of them in your brain. They're not well understood, but some researchers consider them the neurological foundation of empathy. I find it interesting that the three main passenger characters are sort of points on a continuum. Ben is an almost pure materialist, and is certain he can figure everything out; Michaela has been more or less running on faith ever since the plane landed. Saanvi is right in the middle: she's a scientist and looks at things analytically, but she also accepts that there are things happening to her and the other passengers that science can't explain. I get the impression from a couple of passing remarks in previous episodes that her parents are observantly religious, and this has rubbed off on her to at least some degree. The third main subplot involves Olive going rock-climbing with Danny, something he did with her that helped her deal with her depression. This leads to some major Ben-to-Danny awkwardness. The Michaela-Carlos conversation on revenge and the consequences of taking a life reminded me a little of the conversation between John Reese and Dr. Tillman in one of my favorite Person of Interest episodes, "Cura Te Ipsim." Fiona's lecture takes place on Friday, November 16--four days after the first broadcast of the episode. There's a short, beautiful scene where Michaela, after discovering that Evie was Carlos' organ donor, goes to visit Beverly. In the throes of dementia, Beverly is worried that Evie hasn't come home. Michaela tells her, "I saw Evie today. She's okay." In a single evening, Ben goes from the office to the 7:00 pm Fiona Clarke lecture to the after-hours poker game and back home, and somehow manages to sneak dinner in there somewhere, in New York City traffic. Bet you couldn't do that. When Ben first mentioned "SP," I was secretly hoping it would turn out to be the Southern Pacific railroad. Ben's supervisor Ronnie is the "copy machine guy" from early-'90s Saturday Night Live, garnished with a sprig of Jar-Jar Binks. Fiona Clarke, to Kelly Taylor, in a flashback: "This flight isn't happening to you, it's happening for you... Now we're all in this together." What the devil did she mean by that? Ronnie: "You can tell me what it was like when you met the aliens." Ben: "They were nice. Smelled great." Cal, to Ben, in reference to Vance: "You don't have to worry. He's not a bad guy, Dad. Not anymore." Ben: "I want to believe there's a--a reason, but it requires this leap of faith and I can't... I can't trust what I don't understand." Michaela: "I don't understand it any more than you do. But I take that leap, and I follow the calling. And I feel better. For the first time since Evie, I feel like I might just be okay." Collective consciousness, everyone's brain networking to everyone else's. Does that seem like a good idea to you? I suspect Fiona Clarke's never seen any of the Star Trek TNG episodes with the Borg; otherwise, she might not be such an enthusiast. Fiona touts collective consciousness as a defense against "the threat of A.I." There's a cheerful scenario for you: a forced choice between erasing your individuality and joining the hive mind or becoming an NPC in an all-powerful computer's sandbox game. But Manifest seems to be giving us a third option: Romans 8:28. Answering a call, and working together for good under the benevolent guidance of a power greater than any one of us. If that's where Manifest is heading, if the ultimate answer to the mystery of Flight 828 is God, well, that would be rather radical for modern American television. Can't wait to see it. Three and a half out of out of four flash drives. Baby M has never attended an after-work poker game, but would if his workplace actually had them. Labels: :S1.E7, Baby M, Manifest, Manifest reviews, S.N.A.F.U. I enjoyed this one. Although I kept thinking about how you never really have time alone on your first day at work because of orientation and getting IT stuff set up and realizing you can't access stuff you need and talking with your supervisor about your workload, not to mention training and getting supplies for your new desk, and people stopping by your desk all day to introduce themselves... I think I'm too practical about this sort of thing. Completely unsuspended my belief. Interesting review Baby M, congrats. To be honest I didnt have such high hopes for this series. I thought that it trys to much to copy Lost. But I must confess that now Im starting to like it. I think Im hook. The whole idea of a collective consciousness is an interesting one. I have never understood why the Borg were evil, or at least there actions seem evil to an outsider. Im not convinced that a unified collective of minds would be inherently evil, perhaps they coud have indifference or unfeelingness towards the suffering of lesser beings, but Im not sure. A superior mind should in theory have also a superior undertanding of the universe and and a superior compassion. Since the writers of Star Trek have never revealed the origin of the Borg, we can never understand why are so fixated on hurt and assimilate others. Surelly there would be various advantages of a unified mind, as Janeway herself describe it, "...a vast consciousness, billions of minds working together, a harmony of purpose and thought, no indecision, no doubts. The security and strength of a unified will...". Thats an interesting concept. It remind me of one of the central plots of the anime Neon Genesis Evangelion, the Human Instrumentality Proyect and the definition of Self. There's a case to be made that there is nothing automatically evil about the desire for society-wide unity. One of my favorite commentators, Jonah Goldberg, argues that it's an impulse hard-wired into human nature, and I think he's right. On the other hand, free will is also hard-wired into human nature, and appeals to enforced social unity are found in the sales pitch for every totalitarian dystopia and every charismatic tyrant and every cult from 1984 to Mussolini ("Everything within the state, nothing outside the state") to Jonestown to the Kim dynasty. I'm still really enjoying this show, especially how well it balances what X-Files fans would call mythology arcs with the more real-world character moments. The only part that continues to frustrate me is that the two "love triangles"(-ish, they're both a bit unconventional) completely bore me. Michaela/Jared/Lourdes just feels like a bad soap opera, and the only part of Ben/Grace/Danny that I've found interesting is how Olive impacts it, having formed her own bond with Danny while Ben was gone. Much as I really like the core trio of 828'ers(Ben, Michaela, Saanvi), I would love to see more of them become a significant part of the mythology arc. Right now they remind me of the guest scientists who would appear in episodes of Eureka, rarely to be heard from again. Granted, it's still pretty early in the show's run, but we know those three aren't the only ones who've been receiving "callings", it would be interesting to see how some of the others have responded. Nobody read Asimov's take on it, i.e., Gaia?. You can read it in the final (and arguably inferior) Foundation books... Going by memory, those were Borders of the Foundation and Foundation and Earth. Although that's my translation from Spanish, perhaps the titles in English were different (Spanish publishers tend to be really idiotic about that). For me, it sounded really good: a global consciousness that you could pull strength or knowledge from, but that you could also keep out if you wanted (but according to the Gaian in the book, whose name I don't remember right now... why would you?. Guess that's what she had lived all her live and had no problem with it). Thanks for the reviews, it's my first comment for Manifest, which I have to say (I've watched it up to 1x08) that has surprised me very favorably when I expected that it would be Lost Lite (and I hate Lost with a passion after that last season), but with mediocre leads.